The Tektronix 620 is a CRT based X-Y monitor. P/N 016-0409-00 adds an empty plug-in compartment mounted under the monitor, P/N 016-0410-00 adds on mounted beside the monitor. 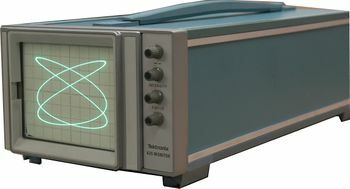 A Tektronix 620 X-Y monitor displaying a differential equation computed by an Electronic Associates, Inc EAI680 analog computer.